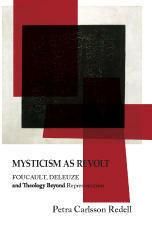 Title: Mysticism as Revolt: Foucault, Deleuze and Theology Beyond Representation Author: Petra Carlsson Redell Imprint: The Davies Group, Publishers soft cover 230 pp. USD 24.00 ISBN 978-1934542316 2014 What if there is no God out there, but a divine creativity down here? Through philosophers Michel Foucault and Gilles Deleuze, Mysticism as Revolt explores faith without the transcendent God of Christian orthodoxy. Foucault and Deleuze address some of the most frequently debated issues in contemporary theology; their thoughts on representation, however, deserve an exhaustive exploration. The author allows the most anti-religious aspects of Foucault’s and Deleuze’s thinking to encounter Christian theology, and examines what Christian theology could be without the oppressive features of representational logic, suggesting that contemporary theology should perhaps not leave its metaphysics behind but understand its task differently. A “post-representational theology” would note the creative force of form, dogma, truths, authorities, eternal gestures and church buildings, but it would not believe in their final power. A post-representational perspective, the author argues, could open up a playful yet serious form of Christian resistance: mysticism as revolt. To repeat, parody and play with whatever comes to the fore as eternal, or as the truth of concrete experience – both when reading and when doing theology – in order to make room negatively for those realities, actual but unknown, unthinkable yet possible, that no language could ever capture. Mysticism as Revolt contains unique analyses of Thomas Altizer, Graham Ward, and Katherine Keller and introduces the theology of Emilia Fogelklou for an English-speaking audience. Author Petra Carlsson Redell (PhD in Theology, University of Uppsala) is an ordained minister in the Lutheran Church of Sweden.